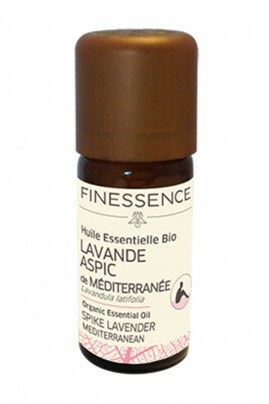 Must-have in aromatherapy, the Finessence Organic Lavender Aspic Essential Oil is known to soothe insect bites and relieve skin problems such as superficial burns of the skin. In cosmetic care, it is used for these regenerative and purifying properties ! It will reduce pimples and promote their healing, ideal for skin with imperfections. Its calming properties are also appreciated in case of sunburn. It exudes a fresh and dynamic scent with a camphor note. In atmospheric diffusion, it offers you a moment of relaxation. It is also known to help soothe headaches such as Peppermint Essential Oil. Organic Lavender Aspic Essential Oil is one of the essential to have in his care kit! In atmospheric diffusion : For a relaxing atmosphere, add a few drops of lavender essential oil to your diffuser. For dosage and diffusion time, follow the instructions for your device. In cutaneous application : In a spoon of organic vegetable oil of your choice, add 4 drops of essential oil. In infusion : In a liter of warm water, add 3 to 4 drops of essential oil previously diluted on a piece of sugar or in honey. Lavandula latifolia (lavender) herb oil, linalool*, limonene*, geraniol*, coumarin*, citral*. Contains: alpha-pinene, beta-pinene, limonene, linalool. May cause an allergic skin reaction. Flammable liquid and vapour. Causes skin irritation. May be fatal if swallowed and enters airways. Harmful if inhaled. May cause damage to organs. Suspected of causing cancer. Toxic to aquatic life with long lasting effects.